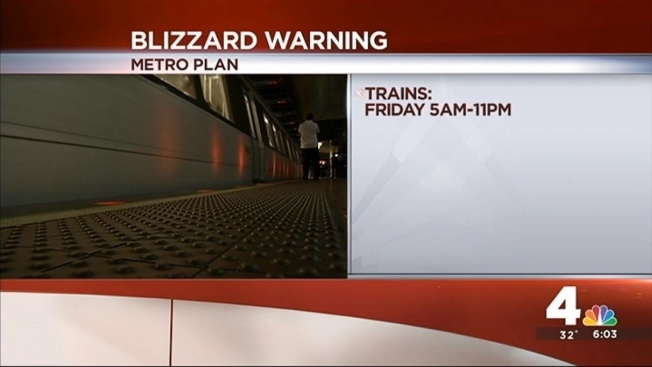 Metro has closed for the weekend due to the potentially life-threatening storm. “We cannot risk putting our customers out there and then leaving them stranded in the conditions we are expecting,” Metro General Manager and CEO Paul J. Wiedefeld said. The last time Metro closed completely was in October 2012 for Hurricane Sandy. Metrorail operated until 11 p.m. Friday and will remain closed Saturday and Sunday. Metrobus service operated only on major routes Friday and ended at 5 p.m. Service will remain suspended all day Saturday and Sunday. Metro is suspending rail, bus and MetroAccess Saturday and Sunday due to the winter storm. "This limited bus service plan enables safe travel during daylight hours and ensures that all customers and employees are not stranded," Wiedefeld said. "We're not putting out service in the morning that we cannot have in the afternoon." 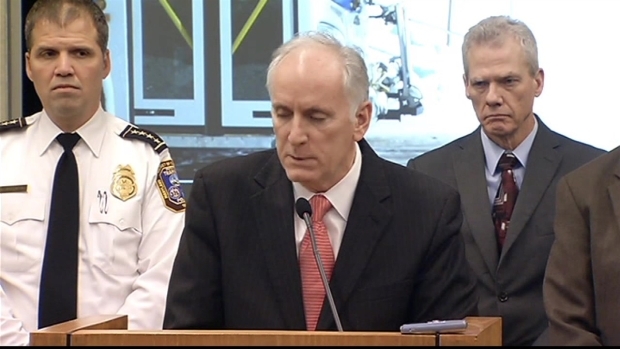 Metro will store trains in underground tunnels to protect them from the elements, Metro spokesman Dan Stessel told News4 in an update Friday night. "That will allow us to return service on a faster timetable than we otherwise would be able to," he said. MetroAccess service was suspended for the weekend at 6 p.m. Friday. To avoid stranding customers, outbound service ended after 1 p.m. in order to get people to their appointments and back again. Monday service is not guaranteed, either. “The plan here basically is to use Sunday as a cleanup day, but let’s see how the storm plays out first,” Wiedefeld said. During the storm, Metro will continuously keep rails clean and will inspect the entire system for problems before restoring service. Metro decided not to continue service underground due to the threat of high winds with the storm, which could result in power outages that would affect the tunnels. Metro's emergency operations center opened at 4 p.m. Friday. The D.C. area is under a blizzard warning until 6 a.m. Sunday, meaning a snowstorm with winds exceeding 35 mph is expected. Storm Team4 is expecting feet of snow across the D.C. area. Metro says its trains can operate very close to normal schedule in snowfall of up to six inches. Metrobuses can provide regular service in one to two inches of snow.